H+E Logistik GmbH designs, produces and installs versatile conveyor systems for the safe and economic removal of excavated material, commodities and building materials. H+E is a worldwide expert in the field of materials handling. The company’s belt systems measure around 30km in length, but longer, specialised designs can be tailored to fit to customer’s requirements. H+E understands that every project has its individual requirements and works in close consultation with customers to find the best solutions to meet those challenges and provide added value. H+E systems are flexible and can adapt to local needs. Efficiency is a top concern for H+E and its systems have outputs of between 250t to 3,000t an hour, and can cope with heads of -600m to 400m. The robust belts work reliably even in adverse conditions, and perform well in temperatures ranging from -40°C to +40°C, as well as at extreme depths and underwater. Intermediate drives, or booster stations, allow for narrow curve radii of less than 200m and increase in efficiency through belt force reduction on long straights. The horizontal and vertical belt storage units also save time and space. H+E systems are ideal for transporting raw materials of all varieties. In the design and implementation of mining projects, H+E always strives for efficiency so that customers profit from the fast realisation of their system and timely commissioning. A sophisticated logistics system guarantees the perfect coordination of all process steps, e.g. when several belts are in operation. Frequency controls of the drives vary the conveyor speeds according to the load, to better manage loads and energy consumption, and belt extensions can be carried out during operation, to ensure faster advance rates. Maintaining a high level of safety is a top priority. For example, comprehensive measures ensure the protection of man and material when there is gas in the ground. 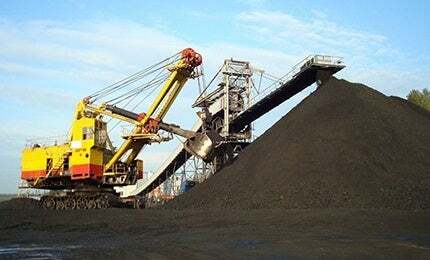 H+E conveyor systems are the product of innovative engineering and constantly set new standards in mining. Both as horizontal systems and vertical conveyors they provide a seamless interface to boring operations. H+E vertical conveyors are the optimum solution for small spaces and can cope with heads of -600m to +400m and have outputs of 250t to 3,000t an hour. Their robust and resilient design, as well as fast installation and low operating costs, are the basis for excellent cost-effectivity. H+E spreaders are designed to meet the precise needs of the object and the conditions on-site. They ensure that, whether stationary, mobile or swivelling, whether a circular, longitudinal, or kidney stockpile, targeted, clean spreading and provide the perfect completion of the conveyor chain. Even when space is tight, H+E spreaders ensure high storage capacities that sometimes reach record-breaking levels, with examples of achieving outputs of up to one million tonnes of coal a month at a capacity of 3,500t an hour. Stable moving systems on rails work faultlessly, even under difficult climatic conditions such as extremely low temperatures of around -40°C and even snow. H+E GmbH is a subsidiary of Herrenknecht AG and has proven its engineering expertise worldwide and established itself as a leading provider of conveyor systems for mining and tunnelling projects. Since founding in 1999 in Bochum, Germany, where it still has its headquarters, the company has constantly expanded. In 2010 it opened a state-of-the-art manufacturing facility in Aschersleben near Magdeburg, Saxony-Anhalt, Germany and later in May 2011, it set up a wholly owned subsidiary, H+E Logistics USA Inc. in Seattle, which currently drives sales activities.